Human beings have killed off some pretty amazing things in our time, but we usually think of these as remote (prehistoric man hunting the last of the mammoths already pressured by the end of the last ice-age), or already vulnerable (the dodo). Americans were particularly good at it. Plains Bison were famously hunted to near extinction in the 1800s, but think about what this means. 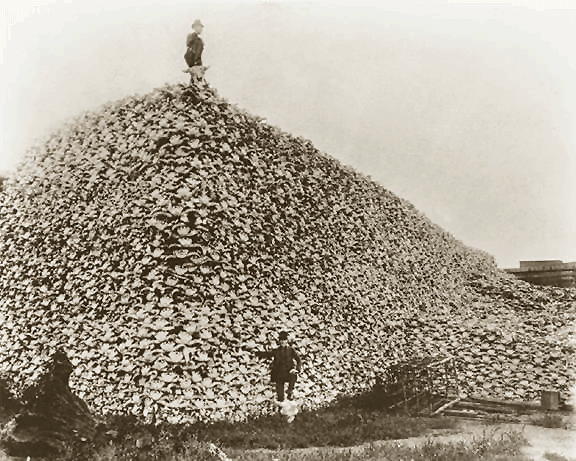 Native Americans had lived in balance with the bison for centuries and the number of animals was such that large populations of humans could prey on them with little change to the bison’s overall numbers. The best estimates of the pre-Columbian bison population are around 30 million animals. At this time they were the most numerous single species of large wild mammal on Earth. With the introduction of guns, Native American hunting escalated to the extent that the Comanche tribe were killing over a quarter of a million animals every year by the 1830s. By the 1870s the industry was in full swing and it is estimated that between 2,000 and 100,000 animals were killed every day depending on the season. Hunters had to put the barrels of their guns in the snow to cool them down. Plains bison were saved from extinction by a few enterprising ranchers who preserved small herds which were later released into National Parks. The Passenger Pigeon was not so lucky. These birds were present in such numbers (between 3 and 5 billion animals) that in 1866 a flock over 1.5 kilometers wide was reported as taking 14 hours to pass overhead. That is, you wake in the morning to find the largest flock of birds you have ever seen blotting out the sky, and as night falls that same flock is still flying overhead. Unfortunately Passenger Pigeons were a convenient and cheap source of food. In 1878 one hunt killed 50,000 birds per day for nearly 5 months. By 1896 the last big flock was killed and in 1914 the last living specimen died in Cincinnati Zoo. More numerous even than the Plains Bison and the Passenger Pigeon was the Rocky Mountain Locust. These insects were so numerous that there were serious questions raised as to whether agriculture in North America would be viable, such were their depredations. The famous “Albert’s Swarm” of 1875 was calculated to cover an area greater than the size of California and contain perhaps 12.5 trillion insects. 30 years later they were gone, and no-one was really sure why. The best guess is that farmers dug up the areas they used as egg-laying beds.